Barely 12 hours after a 5:30 p.m. phone call on Tuesday confirmed her spot on the Philadelphia Freedoms roster for Thursday night, Pittsburgh native Alison Riske loaded up her tennis bag and boarded a northbound train headed for 30th Street Station. Coming to Philadelphia from College Park, Md., Riske thought about what the evening would bring and how the experience would feel. But before she even had a chance to sort it out, Riske stepped inside Villanova University’s Pavilian for her first-ever Mylan World TeamTennis match. 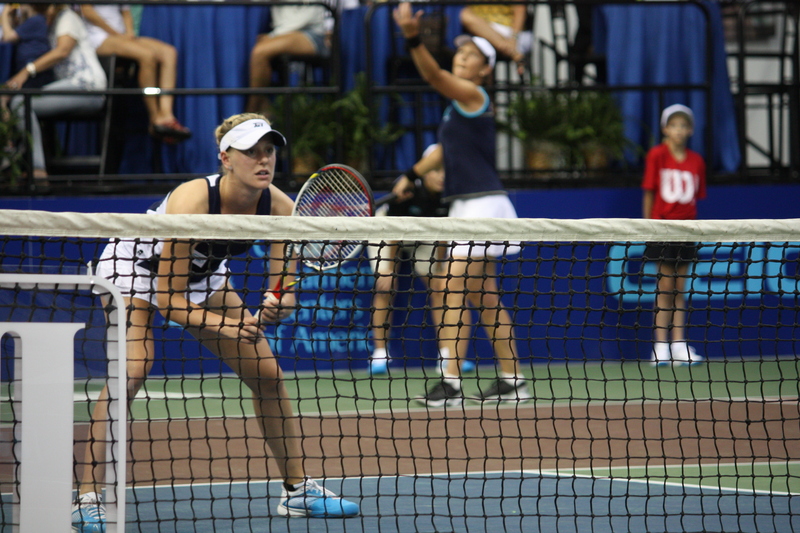 Competing in both doubles and singles against the Springfield Lasers, Riske impressed in her World TeamTennis debut, winning her singles match against fellow American Vania King, 5-3, and dropping a close doubles match, 3-5. The Freedoms lost in overtime to Andy Roddick and the Lasers, but the match kept fans going the whole night. Fresh off a third-round appearance at Wimbledon, Riske fit right in. Obviously excited and happy for the opportunity to play, she cheered on her teammates, high-fived, smiled and laughed every step of the way. The 23-year-old teamed up for doubles with Liezel Huber, a seven-time Grand Slam champion with more than 20 years of playing experience. Riske is certainly keeping a busy schedule this summer. After her strong showing at the All-England Club, Riske quickly returned back to the U.S. to continue training in College Park, Md. On Monday night, she filled a roster spot as an alternate with the Washington Kastles, but didn’t see the court for any action. A day later, she locked down her spot with the Freedoms. Riske, who turned pro in 2009 and grew up in the South Hills of Pittsburgh, said she plans on traveling to Portland this weekend for The Oregon Challenger, a $50,000 USTA Pro Circuit Event, and then will get in as many matches as possible while trying to prep for the U.S. Open. In just a few years as a pro, Riske has already added some impressive lines to her resume. Just last month, she defeated Wimbledon finalist Sabine Lisicki in Birmingham at the Aegon Classic, then took down No. 31 Romina Oprandi in the first round at Wimbledon. Now ranked No. 102 in the world, Riske said she hopes to build on her Wimbledon run and continue to improve throughout the summer, using her experiences in the past several years and her recent success to push her forward.